You can easily create your own internet video streaming TV show. Promote your business, your video skills - show everyone what a wonderful artist or entertainer you really are. 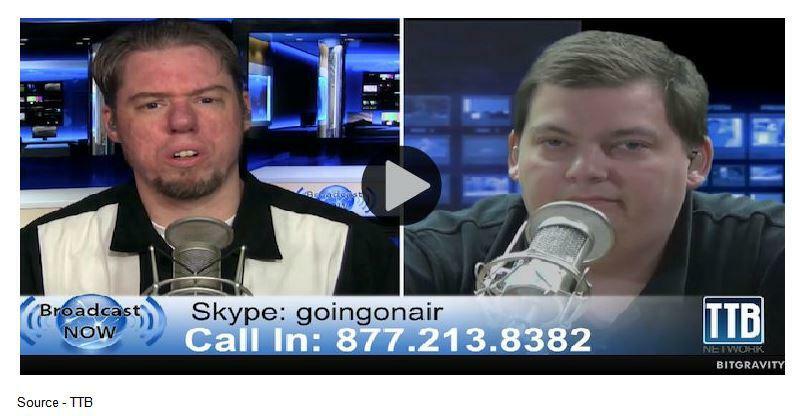 On the Air – Host Stephen Heywood (l) and his co-host Mike Myers are on the air every Tuesday evening to discuss new products, applications and techniques for broadcast enthusiasts, independents and professionals. Low-cost, easy-to-use technology has opened new opportunities for broad and niche audience online TV shows, series and networks. Special interest TV shows and channels have been around for years, serving business technology/application; education and house-of-worship organizations. Historically, they have required expensive studios, equipment and highly trained personnel. But with the growth of independent filmmakers, do-it-yourself smartphone videos and low-cost shoot and post opportunities, individuals and organizations are seeking out new ways to reach people interested in general and specific subjects, news and information. Stephen Heywood is one of the early pioneers in launching an independent TV show and Internet-based TV channel. Ten years ago, Heywood launched his then periodic TTB – The Tech Buzz show – which aired live every Tuesday at 6:00 P.M. EST on thetechbuzz.net to discuss and review new technology products, their pros/cons and how they can be used by ordinary people. Since then, he has refined his focus and message to educate, inform and enlighten people around the globe as to what it takes and how they can enhance and improve their content to become regular fare for very specific audiences as well as the general online community. On the air longer than many commercial TV shows, Heywood has seen – and often assisted – the OTT (over the top) personalized TV industry that draws audiences worldwide to specific TV shows on a daily or weekly basis. But along the way Heywood began receiving email and Tweet requests from people who wanted to take the next step and produce/air their own regular shows on the Internet as he was doing to improve the way they communicated their thoughts, ideas on a more regular, more professional way. Heywood uses Telestream’s Wirecast product which provides everything needed to stream live video from your desktop to the world. Basic Online TV System – TTB regularly covers news and information about the basic “studio” equipment needed for OTT TV production as well as ideas, hints and recommendations on how to improve and enhance online shows. He continued by explaining that today, a basic “studio” can include a MacBook Pro Retina (with PCIe, Thunderbolt or USB 3.0 capture cards), external monitor, one or more cameras (USB, Thunderbolt, SD/HD, SDI, HDMI), microphones (USB, XLR, unbalanced) and an audio mixer. Total cost is under $5,000. “Our audience and the number of online TV broadcasters are growing rapidly," he said. "It starts out as a nice hobby and evolves into a passion because word of mouth spreads interest in your show and the audience grows. You want to keep your audience, so it’s a challenge to continually deliver better content." Heywood notes that he and his co-host, Mike Myers, have slowly shifted TTB from a show that covers the general subject of gee whiz or what’s new technology to a show that focuses on how to assist, inform and educate the online TV broadcast community with an audience that ranges from beginners to intermediate and professional broadcast users. To appeal to the broad range of interests, The Tech Buzz continues to cover everything from computers, cellphones, tablets and the Internet to software and hardware because almost all of the products are being used in some phase of content production and distribution. He noted that he and Mike have begun focusing more on relating the mistakes that they had made in the early days and how the new technologies can be used in broadcasting. In addition, the co-hosts talk about ideas that they have learned can improve the broadcasts for the audience. Whenever possible, they also like to interview industry leaders and professionals about their broadcast techniques, experiences and products that are designed for the broadcaster. Heywood added that for the live show, they have a call-in line for people to ask them and their guests questions. The shows are also hosted online for a year so people can “tune in” and catch a segment they missed or to view again as a refresher. “Looking at the stats, I’m always somewhat amazed – and gratified – as to how often people go back and rewatch a show from three to six months ago,” he noted. To emphasize the point, he said that one of their most popular shows is one they now do annually, which gives the audience a “tour” of the studio and the equipment they use today. Studio Tour – At least once a year Heywood and his co-host Myers give their broadcast-focused TV audience a tour of their operation to discuss what they use for their weekly show, including new gear and software. The show is dedicated to staying realistic and practical for the online TV show producer. He said enthusiast and professional broadcasters like to see what we’ve added to our facility, what has been upgraded and why. “We test it, demonstrate it on the show and talk about it with our guests and audience and suddenly, it is an integral part of our capture, production, streaming studio,” he explained. 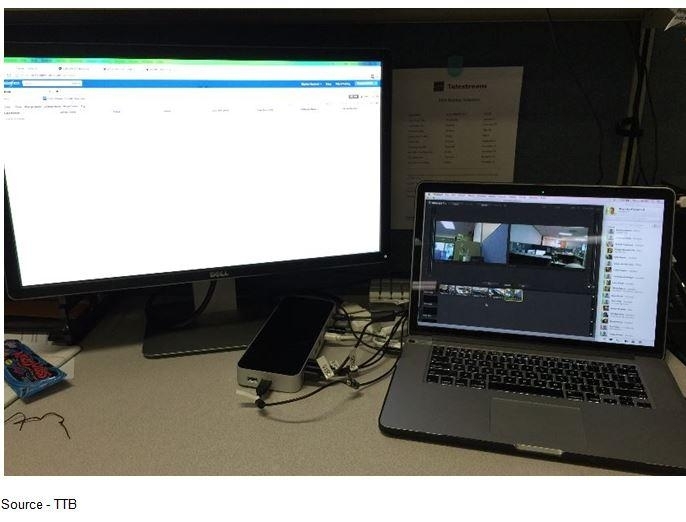 As an example, he cited a recent show that covered the new OWC Thunderbolt2 Dock. He explained the co-hosts’ objective was to show how a Thunderbolt2 Dock could be used by an individual to produce a very professional show without the professional budget. The broadcast set-up included four 1080p Logitech USB webcams, a 20-inch monitor hooked up to the Thunderbolt port on an i7 MacBook Pro Retina. Even with a few other programs open, he was able to easily run the Wirecast at 47 percent CPU usage. Stressing Budget, Quality – Recently, “The Tech Buzz show” highlighted the OWC Thunderbolt2 Dock which allowed Heywood to connect a wide array of capture/production equipment to his MacBook Pro with Retina display and produce a high-quality streaming TV show. With the new set-up, Heywood found the Dock provides the bandwidth and ports needed to add multiple cameras to the Wirecast streaming product in a realtime environment. Noting that the show received a record number of viewer call-ins and online questions because it opened new doors for broadcasters who wanted to take advantage of the portability and power of MacBook Pro Retina and wanted to produce a professional show without spending thousands of dollars. Heywood added that in the near future, he hopes to do a second show to see if he can use eight cameras for a show and still deliver professional-level quality. For the future show, he plans to build on the i7 MacBook platform and add several Blackmagic Design Intensity shuttles, a Thunderbolt mini recorder and connect four pro-quality cameras via HDMI. 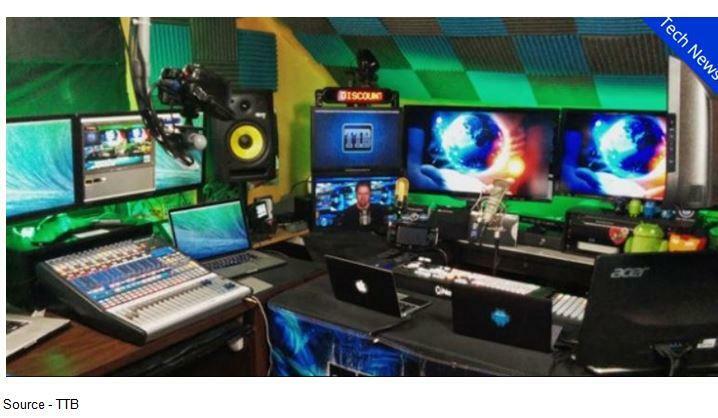 “In theory it should work,” he said, “but it will be interesting because this type of configuration could put a really professional production facility in the hands of individuals and organizations who want to explore and exploit Wirecast iNet TV production. Heywood says he has seen the online Wirecast TV arena grow significantly over the past ten years as hardware/software prices have come down and capabilities have increased. He pointed out that for the fraction of the cost of traditional broadcast hardware, an individual or team can take a laptop into the field and have everything they need to gather the news, produce a professional show and deliver high-quality, live streams over the Internet. He added that a number of TTB viewers are producing shows that include switching between multiple cameras, adding graphics and then recording the show for on-demand viewing. “Now that the Internet is so robust and reliable, I think you’re going to find an increase in what Chris Anderson dubbed Long Tail viewing,” he noted. “There are 10s and 100s of thousands of people who want to abandon conventional TV for a ‘customized’ program schedule. “Of course, that just means the TTB audience will grow because the broadcasters want to improve their shows to capture and retain and audience. And as long as they keep tuning in to see what’s new and how they can become more effective broadcasters, we’ll keep putting on our weekly show,” he promised. Editor’s Note: TTB airs live every Tuesday at 6:00 P.M. EST and VOD of past shows can be accessed on www.thetechbuzz.net.